In the years to come I will be updating this blog with gourmet mushroom growing tips and information. To get this started I want to tell you all about a good company that supplies almost everything you need for growing your own gourmet mushrooms. ShroomSupply.com has been in business for many years and is a trust worthy company with great prices and good customer service. The owner works very hard to to put out quality growing compost and other mycological supplies. 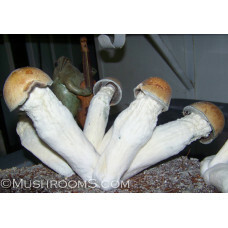 ShroomSupply.com also offers a small mushroom grow kit for dung loving mushrooms like agaricus, portobello, black poplars. You can read more about their mushroom grow kit here. Willy Myco did a review of ShroomSupply.com mushroom grow kit and gave it a great review. You can see that video review here. These kits are nice because they are small and not expensive. Those with limited space and want everything ready to go with our spores would enjoy this kit. Or for bulk growers just buy the compost itself. This is considered a bulk grow compost for projects like monotubs. I seen your promotion about shroomsupply.com for any mycology supplies I may also need for my shiitake and lions mane projects I often do. So I got curious and ordered from Ryan. Now I don't like too admit that I cannot do better but, I CANNOT... He knocked my socks off with his products first off. Then his support and knowledge he has shared about how to PROPERLY administer his steps to produce phenomenal products. Together, you guys should be UNSTOPPABLE Man...!!!!!!! I don't know what else to say other that THANK YOU so much Ryche for turning me on to him and also, for the QUALITY LOVE that you send my way and everyone else. I am at a loss of better wording, my bad. But Thanks for everything thus far, and I want you to know how appreciative I am for this and shall continue to spread the GOOD WORD!!! I give mushrooms.com a five star. I bought my first easy grow kit out of a particular magazine back in 2005, and it sparked my interest in mushrooms, so I started looking into buying spores online, and have tried a few vendors, but mushrooms.com is definitely my favorite, I’ve had almost 100% success with their products, and as far back as I can remember I believe they’ve always offered a smokin good deal. I can’t wait to put a few of these new strains under a microscope and watch the magic come alive. Much love! God bless! Your website won't let me place order. Ryche has the BEST+ Found him before Willy (Myco)! HE is costlier than the "others" but after ALL THE WORK i put into "my babies" i want RESULTS! 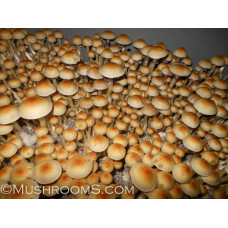 Mushrooms.com is one of only a few spore vendors that carry the original true&nbsp;AUTHENTIC&nbsp;Pe.. This strain of mushroom spores&nbsp;from Brazil comes from a very magical place, the Amazon rain..